the Morning Call Coffee Stand in the French Quarter until the early 1950's. and Saloon was the most notable entertainment establishment in the area. Many of the great early Jazz bands and musicians performed at Midway. his wife, Mare Bonano, his brother, Joseph Quarrella, and Mr. Conti, the bartender. 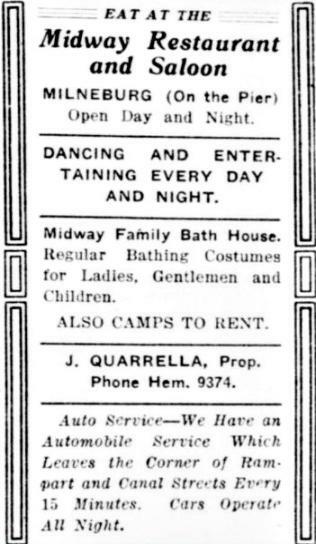 Regular Bathing Costumes for Ladies, Gentlemen and Children. Phone Hem. 2071 J. QUARRELLA, Prop.